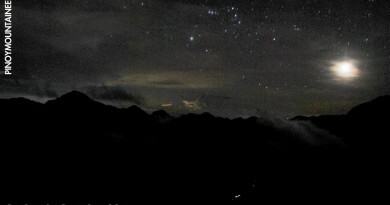 After our Gunung Bromo adventure we proceeded to the Catimoor Homestay, high up the slopes of Gunung Ijen. Java is really vast and this trip took over 6 hours! The homestay is in Blawan Village in Bondowoso – the base of a vast coffee plantation (hence Java’s long association with coffee), and at the hotel, free-flowing coffee and tea were served; both were very rich and flavorful. Fresh strawberry juice was also a delight, and it was very cheap at 3,000 Rp – practically just 15 pesos a glass! There was also a nice hot spring mini-pool where I spent part of the night in deep thought. Early the next day we took a short drive to the jumpoff of the trek to Kawah Ijen. 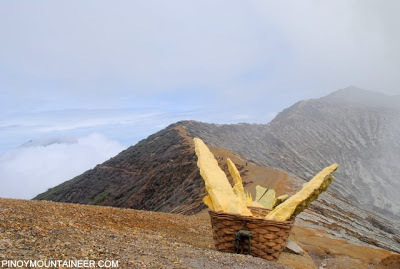 This trail is used both by trekkers and the sulphur harvesters. 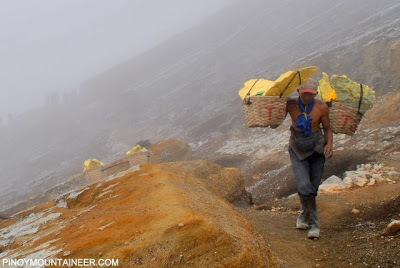 These men carry a total of 70 kilos of sulphur rocks, loaded in two baskets that are hung on their shoulders. 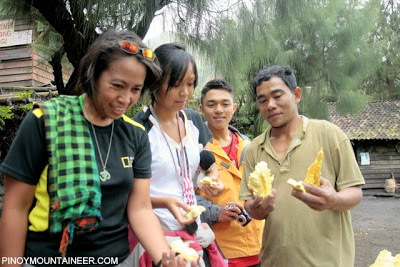 They carry this heavy load up the crater rim and – earning just around 200 pesos per trip! Because the load is so heavy, they’re only able to do two trips per day so . Not to mention that heavy, toxic fumes of sulphur that they have to endure. We will find out later on just how toxic those fumes were. The trek initially passed through forest, and the grassland surrounded by dead tree trunks that look like victims of acid rain. This may very well be the case since sulphuric acid can evaporate and rain down on the poor trees. 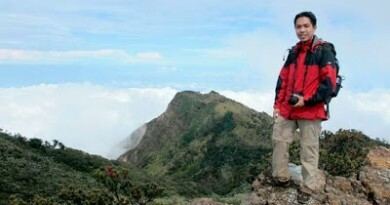 Finally, after 1.5 hours, we reached the Gunung Ijen ridge, where we could view the crater underneath. Sulphuric steam continued to effuse from vents, obscuring an otherwise beatiful crater lake of milky blue-green waters, just like Mt. Pinatubo. There was the option to go down, but we waited for the wind to change direction, so we would be spared of the fumes. Feedback from trekkers who went ahead of us were not reassuring: a Canadian guy got his foot scalded when he tripped into the hot waters of the lake. Others complained of the steep slope and loose rocks; with some mentioned the irritation brought about by the sulphur fumes. 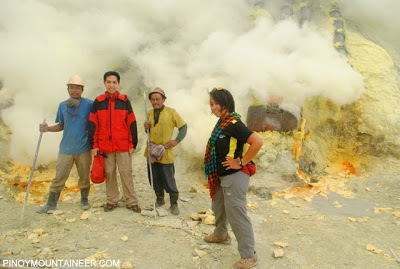 Nonetheless, we pushed through to experience the incredible sulphur mines for ourselves. After around 30 minutes of descent – including picture-taking whenever the wind would change direction, opening up a view of the lake – we reached the sulphur mine. Braving the strong sulphur steam, the men fork out rocks, and haul it up back to the jumpoff c/o the sulphur bearers I described earlier. We saw that permanent hematoma (blood clots) have formed around the bearers’ backs, indicating that the sheer weight of the rocks are taking a toll on their bodies. Of course the sulphur too would surely have some detrimental effect to the respiratory system. But they kept their cheer. Indonesians, like the Filipinos, are a cheerful, friendly people and they even sang traditional songs which we greatly appreciated. Suddenly, while staying near the mine, the wind changed direction and we were engulfed in a cloud of sulphur. Without gas masks to protect our lungs, we tried to run as quickly as possible to escape the toxicity; we made it but our lungs took some toll because I was wheezing for several minutes even after we were out of the cloud; wheezing indicates irritation in the lungs and could lead to difficulty of breathing. Fortunately, it quickly resolved and I did not experience other symptoms. We scrambled back to the ridge, hoping to completely escape the fumes. Then, we headed back to the jumpoff. It was another otherworldy sight that greeted us, just like in Mt. 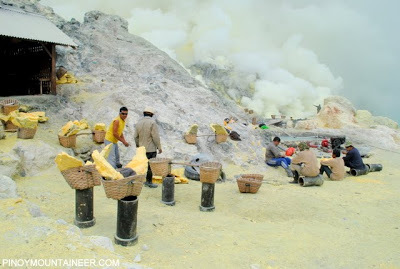 Bromo, but this time there was a human component in the form of the sulphur bearers. The existence of such a livelihood is a thought-provoking example of how man will go to extremes to make ends meet. Perhaps their relationship with the volcano is deeper, and they trust that it will sustain, not destroy them. After the climb with headed to cultural town of Yogyakarta for a cultural interlude, as well as to see the famous temples of Borobodur and Prambanan in Central Java. 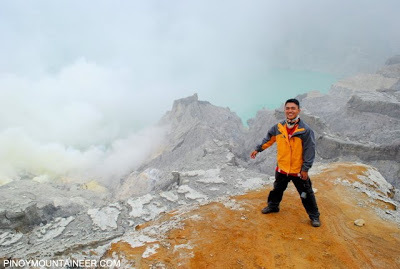 1 Comment on "Hiking matters #85: Journeying Java Part 2 – Kawah Ijen with its incredible sulphur"